Extremely versatile control valves with pneumatic actuators. The product line-up includes electro-pneumatic control valves and self-acting temperature regulators that require no electricity. 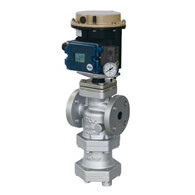 CV-COS, CV-COSR, and CV5 feature a digital I/P positioner combined with a compact pneumatic actuator. Overall compact design makes for simple installation. For controling fluid temperature, pressure, flow volume etc. of steam, water, air and similar. CV-COS is for applications required to supply dry high quality steam.